"My Grandfather owned a drive-in restaurant back in the 1950's. This is his exact recipe for Coney Dogs from back in the day. I make this on special occasions and it is always hit with friends and family. Enjoy." Place the ground beef and onion in a large skillet over medium-high heat. Cook, stirring to crumble, until beef is browned. Drain. Transfer the beef and onion to a slow cooker and stir in the ketchup, sugar, vinegar and mustard. Season with celery seed, Worcestershire sauce, pepper and salt. Cover and simmer on Low setting for a few hours before serving. 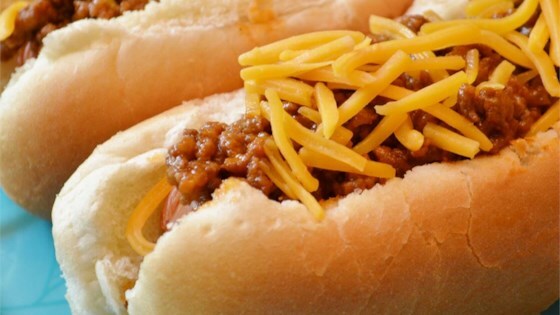 See how to make America’s favorite beefy hot dog condiment. Wonderful sauce for doggies! I added a wee bit more ketchup and put cooked ground beef and onion in my food processor after browning.....Delightful. I will make again and again!